As some of you have mentioned (somewhat passive aggressively) to me over the past few months, I have been neglecting the ol’ beerspectacles and for this I have no excuses, only apologies. As of late I’ve been enjoying the summer and the beer events it has to offer while trying to build my online presence and experience through beer blogging and journalistic-related endeavors. So in a way this blog post is actually pretty weak, I’m just here to tell you about the different sites and things I’ve been working on/with to try to get you to support them too, and to let you know I still care (I even have a new layout, don’t you like it?). 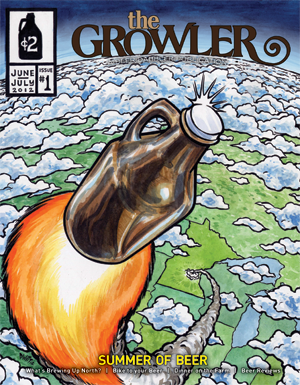 One of my friend’s friends passed me along to Jason Zabel (you may recognize him from the now-defunct AV Club Twin Cities) who is the editor of the Twin Cities newest beer magazine: The Growler. I sent him my credentials and some story ideas and was assigned a story about biking in the Twin Cities and how various breweries/styles of beer pair with the different kinds of bikes people ride. This article is scheduled to come out in the August/September issue, which is both online and print. 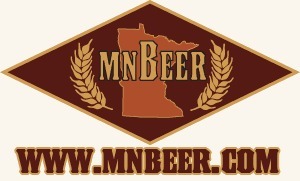 The Growler is a subsidy of The Beer Dabbler, Minnesota’s most successful beer festival organizer (despite my gripes from this year’s winter one), and is paid for by advertising, which makes it free to the public, available at your favorite taproom, liquor store, or homebrewing supply store. Go grab yourself a copy and be expecting to see a lot more of me in there! Your thoughts and ideas are always welcome. As many of you know, I also have a day job that I am technically not allowed to blog about here, so I will not. However, I can’t NOT talk about the beer-brewing I spear-headed for our summer client event. If you follow me on Twitter (@beerspectacles) than you’ve been witnessing the beer as it fermented, but the final update: the beers turned out better than I would’ve ever expected and the turnout at the party was great. More importantly, people LOVED the beer and there was a lot of talk about leaving my job. 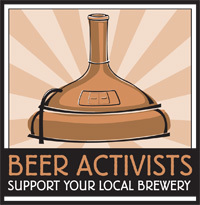 But as many of us avid homebrewers know, there’s plenty of homebrewers out there who want to brew professionally, but very few actually go through with it – it’s just a dream the helps spur the craft rather than change the path. But maybe one day, a girl can dream. 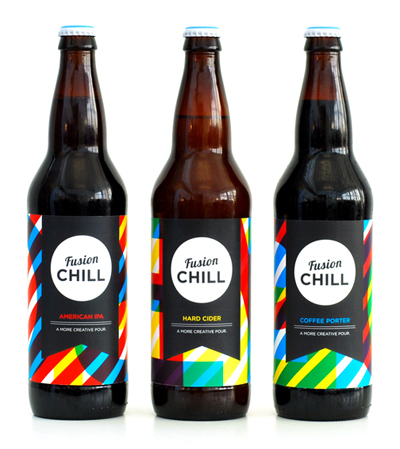 One of our graphic designers did a killer job on the labels as well as coordinated decorations. The three beers: A lightly smoked apple and pear hard cider (everyone’s favorite despite naysaying at the outset), a coffee porter (less people are into these in the summer, but I drank my fair share), and a classic American IPA (for men, since as you may know, I work for an all-female company and we have male clients). Brewing three batches at once isn’t the easiest thing in the world, because it ends up being about a day’s worth of work whatever way you look at it, but it’s fun to get paid to brew beer with your coworkers. That’s it for now, folks. I have other posts in the works (have been for a while) and I promise – pink swear – that I will be better about my avid beerspectacles fans. I love you all. Cheers!